Nonstop. All day. That's how we roll. Me and my three little boys hit up Legoland for an early morning playdate. We got home around noon and I got to work prepping our Sunday dinner. I used to hate Sundays -- for a decade in my 20s it meant I likely had a hangover and for a couple of years in my early 30s it meant work was the next day. That's now changed and Sunday is family day to me. I get the house in order, listen to the italian music station, look out in the backyard at my kids playing while cooking up a storm. The cooler (80s!) weather has me in the mood for Fall, so I made a roast chicken, string bean and fresh corn casserole and crockpot sweet potatoes with peaches. Sunday's are also special because they are the only day I make dessert, so with today's Fall theme I decided to make pumpkin chocolate chip cookies. These cookies are not like regular chocolate chip cookies, so get that out of your head. 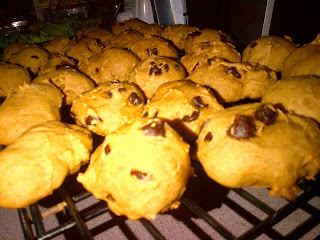 These are puffy, soft, chewy and a bit healthier than the traditional cookies that use butter, oil or shortening since I used unsweetened applesauce in place of those ingriedients. Mix together wet ingredients until well mixed. Add flour, baking soda and cinnamon and mix well. Fold in chocolate chips. Using a cookie scoop drop on greased baking sheet. Bake 375 for 8-10 minutes. My kids loved them! Now off to finish prep for the week ahead! Get it done tip: I do the food shopping Sunday and plan our dinners that have perishable ingredients earlier in the week to ensure nothing goes to waste.